There is no immediate cure for nasal allergy but you can control it by taking adequate preventive measures. But most of us seek medication for relief, as there is a wide variety of allergy reliefs available in the form of nasal sprays, antihistamines, and decongestants. Though these medications provide immediate relief, we are least aware of the side effects that claim our health. 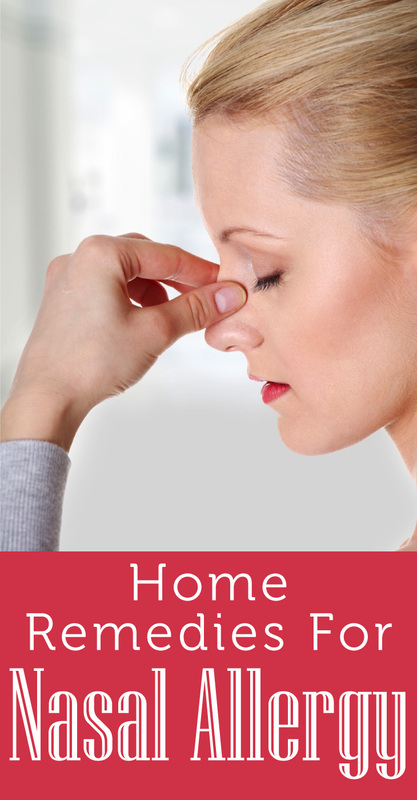 So, it is always better to opt for home remedies and practice yoga to get relief from nasal allergy. One of the best ways to cure yourself is nasal irrigation. It is a personal hygiene practice in which warm saline water floods the nose cavity with the help of a syringe or neti pot, which helps to clear out excess mucus and moisturize the cavity. Make a solution of boiled minced grape fruit and lemon and add to it some honey, and drink it 2-3 times a day. This helps in curing hay fever. To get relief from nasal congestion boil some chamomile and inhale the fumes. Eat a well-balanced diet, include a lot of protein, vitamin B and C, this will help you strengthen your immune system. Ginger and garlic are among the best immunity builder so add them in your daily diet. Green tea with honey and thyme tea with a dosage of not more than 1-2 cups also helps in curing the nasal allergy. Vegetable juices (made of spinach and cabbage) taken on a daily basis for at least 10 days proves very beneficial. A mixture of one tablespoon of honey and half teaspoon of limewater taken along with warm water, early morning is a useful home remedy. Practicing yoga is another natural way of curing it as it involves deep breathing. More people have turned to yoga to cure a variety of illness. Use of natural crystal is another option of curing it. Nasal allergy is mainly due to lack of certain energy in the body which can be increased by the crystal. Avoid smoking cigarette, perfumes and make your home smoke free. Cover your mattress, pillows etc. with plastic to protect it from dust mites and wash your bed covers, curtains and pillow covers in hot water. Avoid going outside when the pollen counts are high and during early mornings and late evenings. Do not let your pet enter your bedroom. Avoid wall to wall carpet in your bedroom and vacuum floors and furniture often. These were some of the preventive measures to control it. But it is best to consult a physician as s/he can only determine the severity of the condition. Sometimes it calls for tests to be conducted to know the allergens.